When I met Tori to discuss her New Years Eve Wedding, it was clear from the get-go that this wedding would be a challenge. Not so much that most of the photography would be undertaken when it would be dark but because this is Rhode Island, and on December 31st it was more than likely going to be very, very cold. 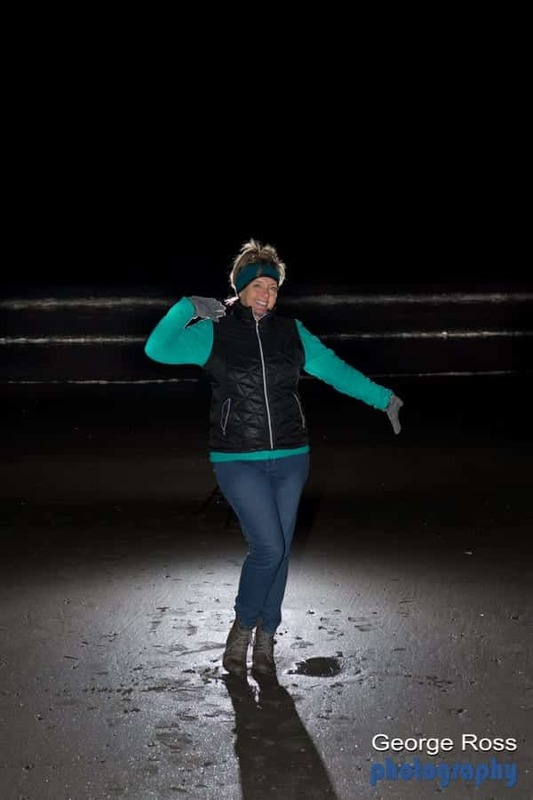 To make matters a little more challenging, we were going to take wedding portraits on the beach at night in the cold. So, how was I going to do this and keep my subjects warm? As I planned the shoot, I realized that I would not have the time to set up the shots in short enough time to keep the bride warm on Narragansett Beach on the 31st of December. The only way this would work would be if I could ‘point-and-shoot’…and I could see no way that I could make this happen without advanced planning. So, I talked my wife into going to the beach one week before the wedding so I could set up my lights and camera to develop a group of settings such that on the wedding night I could simply dial in the settings, and point shoot with great expediency. It cost me a dinner! But on this very cold night, my wife became the body double, and it worked a treat. I was now ready for the wedding! Of course, with the best-laid plans of mice and men, something just had to go wrong. On the wedding night, I went to the beach, set up the lights while the bride and groom were in wedding trolley and when I was fully set, I called them out. Down to the water’s edge came to the bride and groom and the wind was blowing pretty strong on the beach. We set up for the shot, and before I could push the shutter, the wind picked up the bride’s veil and blew it down the beach. It the dark, my assistant, chased the veil down the beach, caught up with it and retrieved it. It was a covered in sand, but we had the veil in our possession. I shook out the sand and fortunately because I was with the bridal party at the hairdressers earlier in the day, I knew how to re-assemble the veil. I re-attached the veil and after that we moved everything along very quickly!